This project was completed during a design internship at the Children's Hospital of Eastern Ontario (CHEO) in Ottawa. Misconnection of an oral syringe to an IV line can be fatal for a patient. Monoject oral syringes are visually distinctive from IV syringes due to their purple plungers. They also have a straight tip instead of a luer lock, which eliminates the risk of an accidental misconnection. 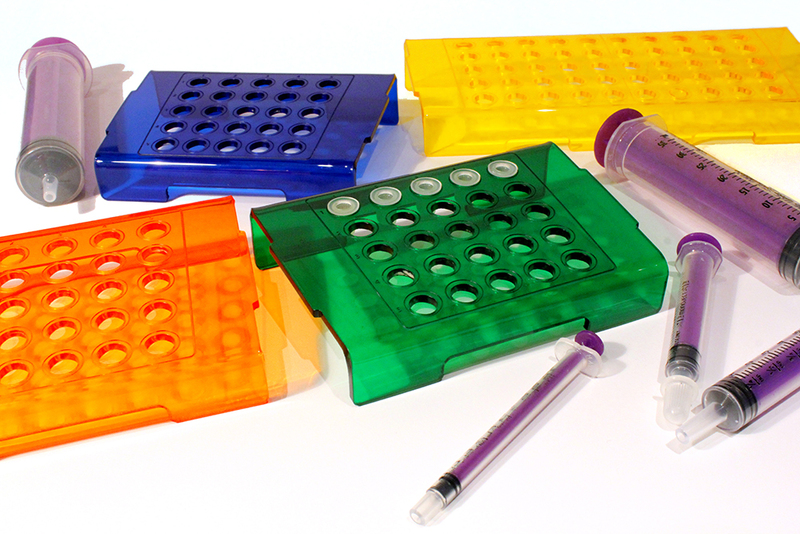 Quickcap trays were created to prove a clean and organized way of setting up for batch filling of these oral syringes in the pharmacy. Despite the benefits of the Monoject oral syringes, their rounded caps greatly increase syringe filling time for pharmacy technicians. I created numerous iterations of the trays using Adobe Illustrator, then fabricated the most promising concepts out of card stock. These models were then tested with pharmacy staff to evaluate form, ergonomics, visual mapping, and overall size. After a slight modification based on user feedback, the final design was fabricated by laser cutting 1/8: acrylic. The edges of these cutouts were heated using a stripheater, and were bent downwards using a simple angled jig.